Hello and Happy Sunday to you! 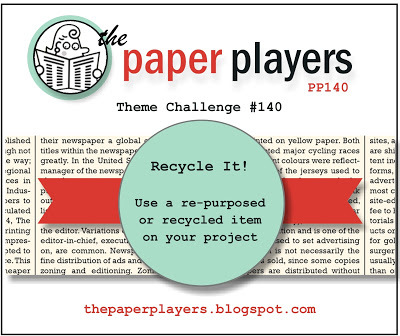 This week at the Paper Players, the fabulous Nance is our hostess with an awesome theme challenge for us: Recycle It! For my card, I used two re-purposed items. 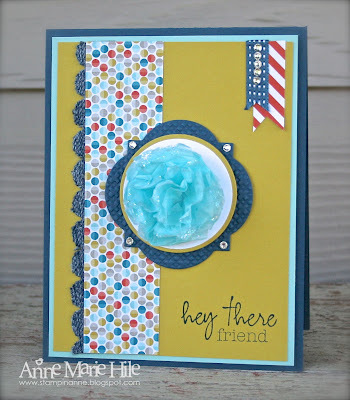 First, I'm not sure if you know that Stampin' Up! has a cool new monthly paper crafting kit called Paper Pumpkin. You can read more about it HERE. Well, long story short, the fun kit comes in this cute orange box and the contents are wrapped in Pool Party tissue paper. That was pretty much the inspiration for my card. I used that tissue paper to create that fluffy flower. I started by punching out 8 circles using the Scallop Circle punch. 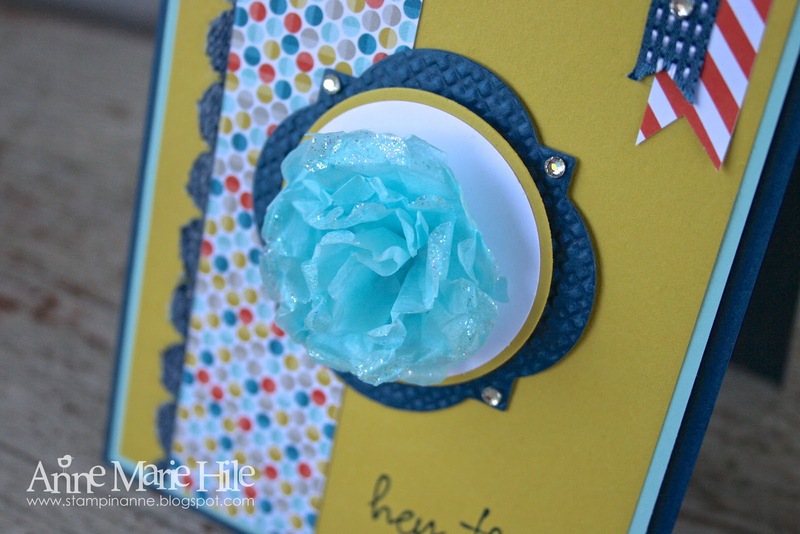 Quick Tip: Punches do not cut through tissue paper really easily. So I just put the tissue over a piece of card stock to make punching them out a little easier. 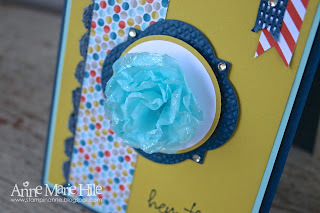 Added bonus, you have some extra punches to use on another project (or for a class or a club). It could be a time saver if you are organized like that. I am not. Ha! After crumpling up the tissue paper, I layered all of the punches on top of each other and popped a mini brad through the center to hold them together. Then I added some Dazzling Details glitter glue to the edges of the flower for a little extra sparkle. My second re-purposed item was an old pair of jeans. They were a favorite pair, so I figured they could live on in a stamp project. 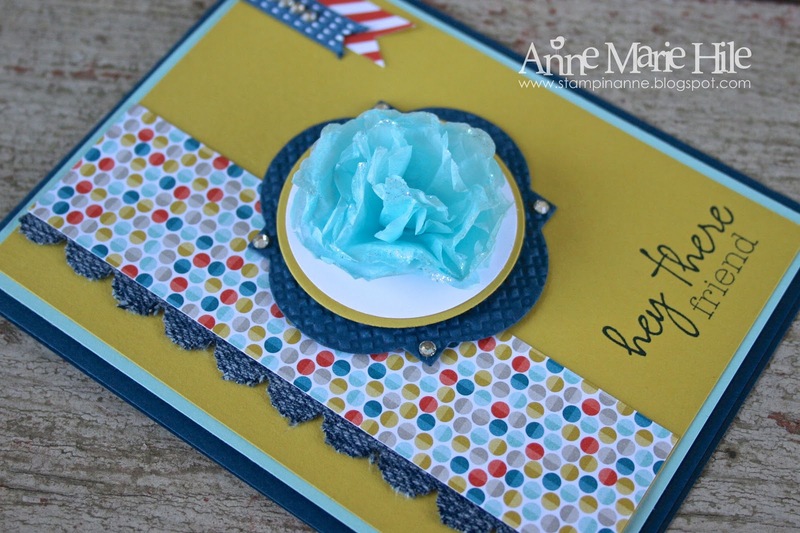 I used them for the scalloped border. That cute sentiment is from the Paper Pumpkin kit. I love it! Obviously this is not a card I plan to mail. This will be one I give in-person or add to a gift bag to dress it up. The rest of the supplies I used are listed at the end of my post. Super cute....I just LOVE that flower! I didn't get the Paper Pumpkin; now I might have to, just to get that tissue! And I love your jeans embellishment. I had tried to cut jeans once before in my Big Shot, I guess I need to use a Bigz die, huh?! Awesome effect! Anne Marie this is such a cute card. Love jean material! so cute. and the little flower is FAB. Love the Pool Party tissue... I really like pool party anything. hugs. OMG, AM...you had me at "Pool Party tissue paper"!! Love this! Combined with the texture of the jeans and all those fabby colors and it's a recycled masterpiece! 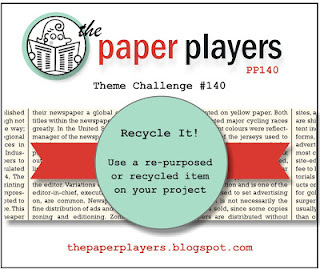 Love the little ribbon and banner flags too...thanks for rocking the recycled challenge, my friend! Oh so cute, Anne Marie! I LOVE the Pool Party flower. I was wondering where that came from. lol Using the jeans adds so much texture! Great job!